FRA to be effective at the state level. Fiscal responsibility acts have become increasingly common tools to enhance fiscal prudence and public expenditure transparency in many countries. In Nigeria, fiscal profligacy at the sub-national level has emerged as a major contributor to state corruption and macroeconomic instability. While the federal government has enacted the Fiscal Responsibility Act (2007), the major challenge is reconciling the economic rationale for fiscal responsibility with the political demands of fiscal federalism. Although several states have recently ratified the FRA, this has not been matched with concrete policy reforms that enhance fiscal discipline and public expenditure transparency. Likewise, the federal government has been unable to persuade state governments to rein in public spending and centrally co-ordinate macroeconomic policies, contrary to the provisions of the national FRA. 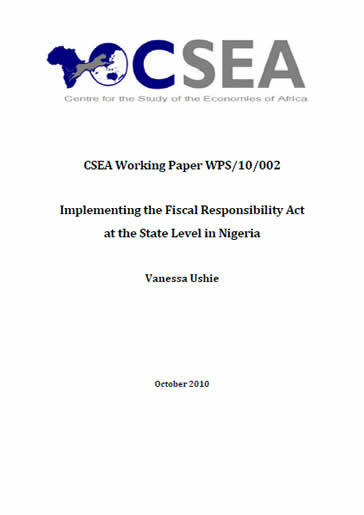 The paper explores the policy framework for implementing the FRA across the 36 states, and identifies the underlying macroeconomic principles required for the FRA to be effective at the state level, and the political economy challenges facing the states in entrenching fiscal discipline in Nigeria.